My two favorite colors are purple and green. So you can probably understand why I was so attracted to the J. 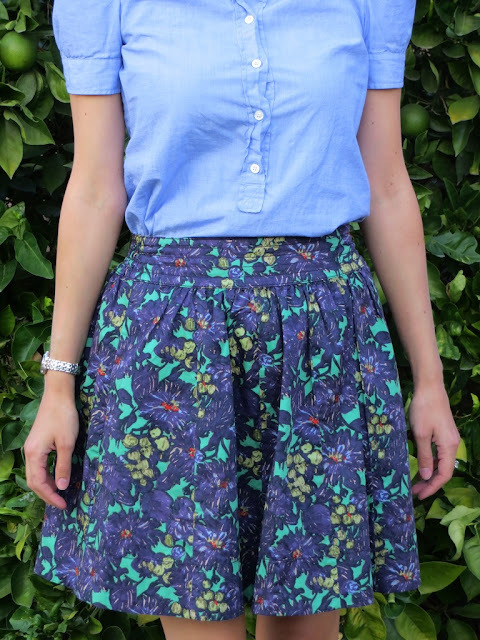 Crew Elsie skirt in a pattern called "Nightfall." This particular skirt was part of J. Crew's 2011 fall collection. I love J. Crew prints, especially this one. It's not what you would typically expect from a floral print. I also love how J. Crew always has a story about how they discovered whatever print they are featuring. For example, you will often read a description in their catalog which claims something like this, "We found this print on a swatch of wallpaper discovered in the attic of a Chateau having an estate sale in the South of France..." Well, I just made that up, but if you have ever read the J. Crew catalog from cover to cover (like I have) you might know what I mean. My questions for J. Crew CEO Mickey Drexler is, "Are you just making this stuff up because it sounds good in your catalog or is this actually how you discover new prints and patterns?" Regardless, I am smitten with the patterns put out each season by J. Crew. If the "glamorous" stories behind them aren't real, then I don't want to know! This skirt was apparently inspired by an oil painting. To match all of the plum craziness of my outfit I am wearing one of my favorite and most comfortable pumps by Miu Miu. As you can see there is a lot of purple going on with this outfit. One can never have too much purple!